Four years after its initial release and five months after its sequel, but who's counting? Today Ubisoft announced that South Park: The Stick of Truth will arrive on Nintendo Switch next Tuesday, September 25. Which is just four years and change after its initial release in March 2014, and roughly five months since the April Switch release of its sequel, South Park: The Fractured But Whole. The Stick of Truth will go for $30 on Switch and will only be available digitally. For the uninitiated: South Park: The Stick of Truth is a funny little RPG made by Fallout: New Vegas developer Obsidian Entertainment and with the input of South Park creators Trey Parker and Matt Stone. 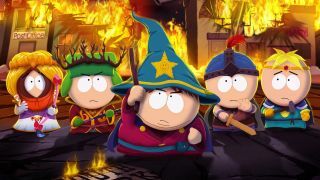 You play as the new kid on the block and accompany iconic characters like Stan, Kyle and Cartman through an imagination-fueled fantasy war which plays out in turn-based combat. Way back in 2014, we called The Stick of Truth "an absolutely fantastic, surprising experience" suited for fans of the show as well as as "anyone interested in a light, open-world RPG." Notably, it's also an M-rated game, and mature games are fairly uncommon on Switch. Granted, being a South Park game, The Stick of Truth is cartoony, but it's also gross and perverse and crass—delightfully so. Suffice it to say, it's the kind of game Nintendo would never make, so it's nice to see the company pursue games like it for release on Switch. For more games coming to Nintendo's new system, check out our list of the best upcoming Switch games. And if you're looking to get the most out of South Park: The Stick of Truth, have a gander at our guides for finding all 120 friends, collecting all 30 Chinpokomon, and completing every last side quest.